We can essentially move around all of the numerators as we see fit. Both of those expressions are in fact exactly the same, just written two different ways. And in the second version, perhaps the reason we can cancel the two x's is clearer. That is, one x is in the denominator position, and three x's are in the numerator position. So we can therefore cancel two x's. So in short, the basic rule to know here is that anytime we have the same number or variable in the numerator as in the denominator, we can cancel them. The trick is just getting the expression in the right form so that we can easily see which values we can can cancel. 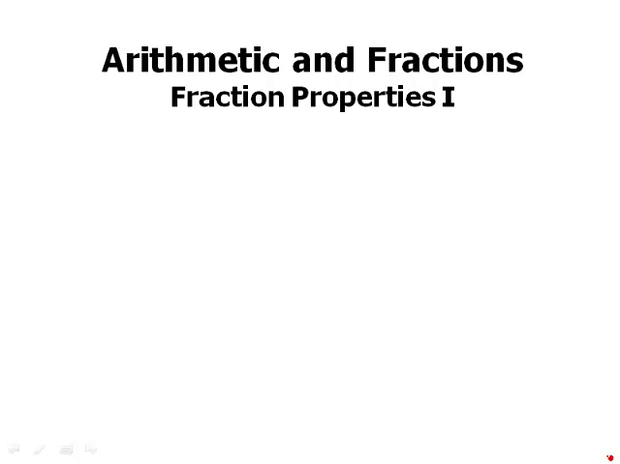 In this video, we'll discuss some of the basic fraction properties. And we're starting out with some very basic properties here. First of all, fractions with a denominator of 1. If we take any integer and put it above 1,. Then we get something very simple, and it just equals that integer. So, 7 over 1 equals 7. Or 135 over 1 equals 135. In general, the pattern is, n over 1 equals n. Now it's very important to appreciate. That first of all, we can use this to write an integer as a fraction. So, we had 4, we could write 4 as a fraction. We could write it as 4 over 1. We could write any integer n, as the fraction n over 1. Why is this important? This is not tested directly, the test is not gonna ask you what does 135 over 1 equal, that's not gonna be a question. But, this is an important step in problem solving. For example, later on, when we talk about adding fractions, when we talk about how to add a fraction to a number, to a whole number. Well, it turns out that it's very useful in that scenario to rewrite the whole number as a fraction, and this is how we'll write any integer as a faction, just by putting it over 1. So 4 we can write as a fraction writing it 4 over 1. That's an important problem solving step that we'll need later. Second property, fractions involving zero. This is a tricky issue. People sometimes get confused here. So let's be clear. First of all, we cannot divide by zero ever. It breaks the mathematical law to divide by zero. So in other words to have a fraction with zero in the denominator, that actually breaks the mathematical law that creates something that goes outside the realm where we're able to assign mathematical meaning. So, it is in the most profound sense something mathematically meaningless. So the test is not going to make you deal with things that are mathematically meaningless. So don't worry. You're not going to have to, you're not going to be asked to evaluate a fraction with zero in the denominator. You just have to remember that is an illegal thing. That is something you have to keep an eye out for. If that's a possibility, things no longer make sense. Now having said all that- It's perfectly allowable, to divide zero by a number. We can have zero in the numerator, that's perfectly fine. Zero divided by five is zero, zero divided by negative three equals zero, those are one hundred percent valid equations, we can write the equals sign, that is well within the realm of mathematics there. Zero divided by any non zero number equals zero. Very important. Zero can never be in the denominator, but is perfectly fine in the numerator. Fractions of the form n over n. So what's going on here? As long as n is not equal to zero, then n over n equals one. So here n could be an integer, but it could be any other kind of number. It could be positive, it could be negative, it could be a decimal, it could be an ugly radical. It could be any kind of thing as long as we put anything over itself. As long as it doesn't equal zero, then anything over itself equals one. The big idea here. Is we can always multiply any expression by n over n because multiplying by one never changes the value of anything. And this will be hugely important when we get to the point where we have to find common denominators. So this is a really important fundamental idea and we'll return to this later. Finally, the issue of reciprocals. This is actually a word you need to know. The test could use the word reciprocal in a problem, so you need to recognize this word. The reciprocal of a fraction, a over b, is the flipped over fraction, b over a. Again, we're assuming that both a and b are unequal to zero. So for example, the reciprocal of 3 5th is 5 3rd. The reciprocal of negative 7 halves is negative two 7ths. The reciprocal of 1 6th is 6 over 1, while 6 over 1 as we saw a moment ago, just equals 6. It equals the integer 6. So, the reciprocal of 1 6th, the fraction 1 6th. Is the integer 6, so there are few important properties of reciprocals that is important to know. First of all, the product of any fraction with its reciprocal equals 1, so they cancel out, so 4 times, 4 17th times 17 4th equals 1. That's a really important idea. And we're gonna use this to solve a problem in a few minutes. Second. The reciprocal of any positive integer is simply one divided by that integer. So the reciprocal of 6 is 1 6th. The reciprocal of 117 is 1 over 117. In general, the pattern is the reciprocal of n is 1 over n. Now certainly, this works when n is an integer. But it turns out n doesn't even have to be an integer. We can extend the pattern, and we can use that same pattern when n is not an integer. So 1 divided by any number, for example 1 divided by a fraction, equals the reciprocal of that fraction. So if I take 1 divided by 3 7th, that's going to equal the reciprocal of 3 7th, which is 7 3rd. So that's a really deep idea there. This already suggests the rule for fraction division, which we'll discuss in an upcoming video. So if you really understand this connection well, you will understand fraction division well. Finally, if the numbers bigger than 1 then its reciprocal is smaller between 0 and 1. If a number is between 0 and 1 then its reciprocal is larger than 1. It's very important to have this fundamental number sense, that how big a number is, how big its reciprocal is going to be. Very important to have a keen sense of how big and small numbers are. So here's a practice problem. I'll recommend pause the video here, and then we'll talk about this problem. Okay. The reciprocal of a positive number times the cube of the same number equals 5, what is the number? Well, I'm gonna represent this unknown number by x. I'm gonna use a little algebra here. So if x is the number, the reciprocal is 1 over x. And of course the cube is x cube. So we're saying, that 1 over x times x cubed equals 5. That's our fundamental equation. We'll that x cubed literally that means x times x times x, I'm just gonna write that out. Now I'm gonna take advantage of the first property of reciprocals namely, a number times it's reciprocal cancels out, a number times a reciprocal is 1, so 1 over x times x together that's just gonna equal 1. So they cancel and I"m just left with x times x. So in other words five equals x squared. Now normally, we'd have to consider both the positive and the negative square root but the problem tells us that we're dealing with a positive number. So because we're given that guarantee we only have to consider the positive root. And that means that x equals positive square root of 5. In summary, any fraction of the form n over 1 equals n.
So in particular, this allows us to write any integer as a fraction. And that turns out to be useful in a variety of circumstances. Fractions with zero, we talked about these. So zero can be in the numerator, zero divided by n is zero, but zero can never be in the denominator of a fraction. That's very important. We talked about the rule n over n equals 1. And again, how this'll be very important as a multiplier. We can always multiply by n over n, because when we're multiplying by that, we're multiplying by 1. And finally, we talked about the properties of reciprocals.